An Iranian Para-cyclist has died after a crash during the men's C4-5 road race at the Rio Paralympics. 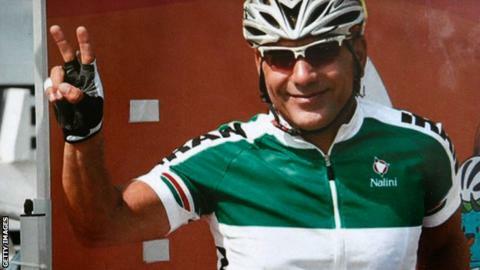 The International Paralympic Committee said Bahman Golbarnezhad, 48, suffered cardiac arrest after the incident on a "mountainous stretch" of circuit. "The ambulance then diverted to the nearby Unimed Rio Hospital in Barra where he passed away soon after arrival," a statement added. Golbarnezhad also competed at the London Paralympics in 2012. An investigation into the circumstances of the accident has been launched. "We're looking to gather as much information as we can and as quickly as possible - it should take a matter of days," said Piers Jones, sports director of cycling's governing body UCI. The Iranian flag has been lowered to half-mast in the Paralympic Village and a period of silence will be observed during Sunday's closing ceremony. Masoud Ashrafi, the secretary general of Iran's National Paralympic Committee, said it had requested the body of Golbarnezhad be flown to Iran on Sunday. The Committee also asked for a full report of the incident from the IPC. Ashrafi added: "He had been cycling for 12 years and he was our best cyclist. He was married and has a wife and one son. "He was the kind of man who was a family man. He loved his family." Golbarnezhad's death is the first in competition at a summer Olympics or Paralympics since Danish cyclist Knud Enemark Jensen in the 100km team time trial at the 1960 Rome Olympics. What details are known about the accident? Saturday's race began at Pontal and included the Grumari circuit used in the Rio Olympics road races. The Vista Chinesa circuit, which included a treacherous descent where Annemiek van Vleuten of the Netherlands crashed and sustained concussion during the Olympics, was not part of the Paralympic course. According to the IPC, Golbarnezhad was involved in a crash at around 10:35 local time on the first section of the Grumari loop, a mountainous stretch of the course, on a curved descent. The BBC's South America Correspondent Wyre Davies said reporters were told Golbarnezhad suffered "catastrophic head injuries after falling from his bike at speed on a steep, tight part" of the course. He received treatment at the scene and was in the process of being taken to the athlete hospital when he suffered cardiac arrest. IPC president Sir Philip Craven said: "This is truly heartbreaking news and the thoughts and condolences of the whole Paralympic movement are with Bahman's family, friends, and team-mates as well as the whole of the National Paralympic Committee of Iran. "The Paralympic family is united in grief at this horrendous tragedy, which casts a shadow over what have been great Paralympic Games here in Rio." The race was Golbarnezhad's second at the Rio Paralympics, after he finished 14th in the C4 time-trial race on Wednesday. Golbarnezhad, from the city of Shiraz in southern Iran, also participated in the London 2012 Paralympics. He lost his left leg in a land mine explosion and took up the sport in 2002, competing in events for athletes with lower limb impairments or amputations. Iranian Paralympic Committee: "He was an exemplary Paralympic sportsman who, with love and energy, tried his best to promote the name of Iran and to make all of us proud and at the end he gave his life for this. "All members of the Iranian cultural and sports camp here express condolences to his family and the Iranian nation. The name of Bahman Golbarnezhad will be inscribed in the proud history of Iranian Paralympics." Carlos Nuzman, president of Rio 2016: "This is very sad news for sport and for the Paralympic movement. Our hearts and prayers are with Bahman's family, his team-mates and all the people of Iran." Brian Cookson, president of the UCI, cycling's governing body: "I am devastated to hear about the death of Iranian rider Bahman Golbarnezhad. Our thoughts are with his family and friends, and the NPC of Iran to whom we offer our most sincere condolences." ParalympicsGB: "We are devastated by the news of Bahman Golbarnezhad's passing. Our thoughts are with our friends and colleagues from NPC Iran." United States Olympic Team: "Our thoughts are with the friends, family and team-mates of Team Iran's inspirational cyclist Bahman Golbarnezhad." Dame Sarah Storey, Britain's most decorated female Paralympian, also paid tribute to Golbarnezhad in an interview with BBC Sport. "I'm absolutely devastated to hear of a colleague who hasn't made it home from the Games," said Storey, who had earlier won Britain's 60th gold medal in Rio. "Everyone expects to come home from a Games and it's no real condolence that he died doing something he loved. "It's just an horrendous thing. It couldn't be any worse. There are no words that can make it feel better. "When you lose someone you don't even know but they are in the same world... I was sat opposite him in the pits this morning. I know who he is but I've never spoken to him. It still hits you really, really hard."